As the Board of Education and the Chicago Teacher’s Union lock horns over impending budget cuts, Chicago’s teachers spent the past week in the trenches participating in a radical citywide ‘work-action’ experiment. In the Northside High School teacher’s lounge (where folks do anything but lounge), jaws dropped as CTU delegates explained the new world order: for the following week, teachers would only work their contractual obligations. To the letter, Governor Rauner. Click. Clack. Moo. “How will we teach effectively without arriving an hour early and staying an hour or two late, and working evenings and weekends?” 19-year veteran English teacher, Nora Flanagan asked in disbelief. Teachers, already struggling against budget constraints and workflow logistics, have been working double and triple overtime to fill in the gaps. True to their calling, several teachers decided to turn the challenging ‘work to rule’ experiment into a teachable moment. Before the week began, the very idea of stopping work at 3 o’clock sharp seemed unimaginable. A daily commute without responding to parent’s phone calls on the fly? Cooking dinner without simultaneously grading papers, preparing in-class and observation materials, and responding to emails from every possible school community stakeholder? Surely classrooms would implode if teachers had time to be, well, normal? Twelve-year veteran math teacher, Jill Sullivan, left an eleven-year career at Accenture where time-tracking for billable hours was the rule. Since 2008, she’s been conducting her own ad hoc ‘work-to-rule’ experiment at Northside, collecting data on her colleagues’ productivity and analyzing the results (*see below). By her calculations, CPS teachers require at least twelve additional hours per week to perform their school duties to maintain even adequate levels. This total does not even include the extra unpaid time allocated for mandatory after-school tutoring, coaching, or extracurriculars that help Northside consistently rank as one of Newsweek’s top ten high schools in the nation. OneTab: If you have a gazillion tabs open all the time, you’re hogging your computer’s memory. Converts all your tabs into one list that you can pop open as needed. Boomerang: Write emails now but send them later and remind yourself if someone hasn’t gotten back to you. Goo.gl url shortener: An extension which allows you to shorten the current website with two clicks (no more tiny.url’ing). HelloSign: Makes signing documents super easy. No more download, print, sign, scan, upload, send. Ms. Flanagan concurs but sees larger takeaways for others struggling with work-life balance. “I’m taking huge lessons from this action regarding the value of my time and setting limits around my working life. It’s high time I stopped carrying around the consistent sense that I’m perpetually falling behind.” That compartmentalization might be short lived. Ms. Sullivan’s data suggests that high-performing veteran teachers work even more hours than their less experienced peers. However, Springfield isn’t delivering a lesson on self-compassion or smart work habits. This is a fight about money and that’s not something that a digital life hack is going to fix. Teachers aren’t shift workers any more than students aren’t cogs. The only platform that really fixes this is a political platform that supports the reality of investing in world-class education. Coders don’t build that platform. Citizens do. Want to support Chicago’s teachers? And let’s show teachers all over the country some love! Create a simple page like this in 60-seconds and easily collect videos of students telling their teacher why they’re appreciated. Then, use your free code (teachersrock25) to edit the clips together into a powerful montage that you can give as a gift. Here’s a sample Tribute video that Teach For America created last year during Teacher Appreciation Week. Isn’t gratitude the best life hack of all? *Ms. Sullivan’s combined data suggests Northside teachers, like most professionals, regularly overlook their contractual hours to get the job done. Workload does not level off over time. Color coded by year the data was collected, each dot represents a teacher that shared their data. Thus, (1, 10) is a 1st year teacher working 10 extra hours/week while (1, 23) is one putting in 23 hours/week. 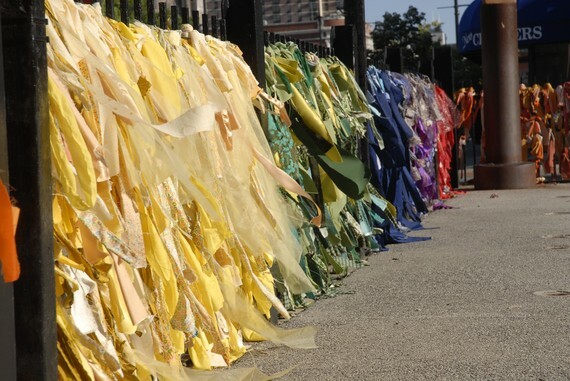 With Sister Sledge’s “We Are Family” blasting, students, teachers, parents and community members tied thousands of fabric strips to the schoolyard fence. After 15-year-old David Fite tied the last piece into an expert bowline — arguably the strongest knot with the least stress to the lead line — the only thing standing between the boy and his lifelong dream of becoming an Eagle Scout was a rainbow. When he overheard camp counselors discussing the Boy Scouts of America’s institutionalized homophobia two years ago, David returned home to Chicago despondent. “I was having a blast,” he recalls. 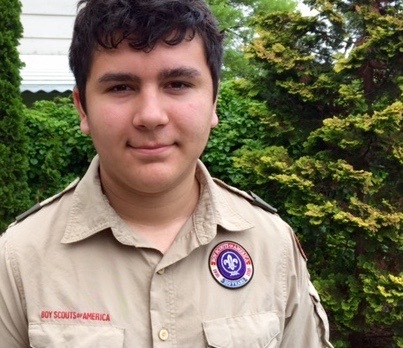 “I couldn’t understand why any kid, gay or straight, wouldn’t want to be a part of it.” After a quick Internet search confirmed his worst suspicions, David told his mother that he needed to quit or follow the lead of a handful of Eagle candidates who were earning, then returning, their badges in protest. Since her son loved camping and his troop, and was so close to achieving one of the country’s highest honors, she proposed another idea: If he thought the policy was so immoral, why not convince the organization to change it? Watching a handful of local chapters mobilizing to defy the new ‘don’t ask, don’t tell’ policy, David sensed an opportunity to move the needle. A boy’s final step to earning his Eagle badge is to “plan, develop and serve as a leader to others in a service project helpful to his religious institution, school,or community.” And so was that last month, a council of Scout elders found itself navigating in uncharted territory. Each Nettelhorst student has tied a piece of fabric to the fence as a tangible sign of his or her personal intention to create a better world. As Nettelhorst, we’ve also made a collective intention: that each of us becomes kinder, gentler and more tolerant. Here, the rainbow colors of gay pride are a visible sign of our respect for the neighborhood of which we are a part, and the diversity of families that we serve. 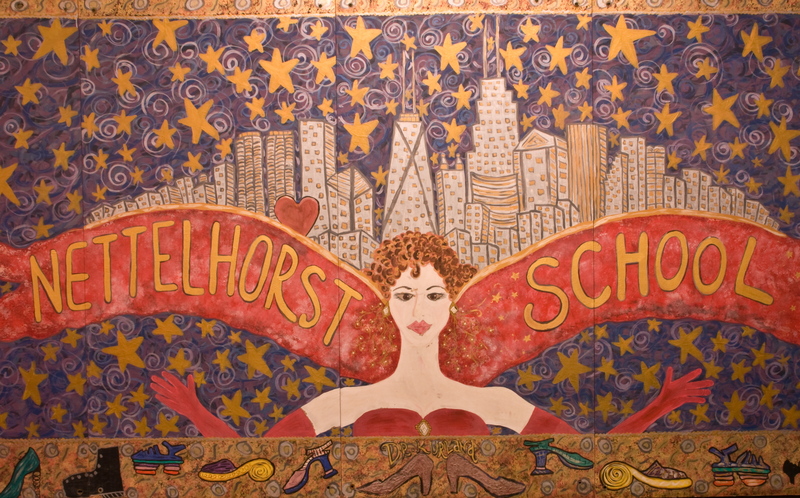 In June, Nettelhorst will be the first public school to walk in Chicago’s Gay Pride Parade. We believe family means everybody. Enjoy the summer: SPF 50, baby! Many a passerby stopped, smiled, tweeted and posted; some even cried. The rag-tag public civics lesson had inspired a deeply personal, neighborhood catharsis. But when the Chicago Tribune ran a front-page story cheering our efforts, Nettelhorst landed on every hate blog in the country. We even had the “God Hates Fags” Westboro Baptist Church up from Kansas protesting. Critics accused the school of corrupting innocent children, and using them as pawns in a decidedly liberal social agenda, all on the taxpayer’s dime no less. Under death threat, 200 Nettelhorst families marched in the parade that year; in fact,we led it. The outpouring of support from the 140,000-strong crowd was overwhelming, as if we had taken away generations of hurt in one surreal-therapeutic-Kodachrome coronation. This year, David Fite of Boy Scout Troop 115 chose the Nettelhorst Pride install as his Eagle rank community project. The Eagle rank is the highest advancement a young boy can achieve in the scouts — and by leading and completing the Pride projects at Nettelhorst Elementary School, he not only shows that a boy scout must be prepared, but kind, respectful and understand that love is what we all have in common. Next to the fence, at the corner of Aldine and Broadway, stands a forty-foot ash, one of the few trees to survive America’s devastating emerald ash borer infestation. David’s troop leader climbed a tall ladder to hang disco balls from the branches; fellow Scouts wrapped the trunk in colorful ribbon; Nettelhorst kindergarteners sprinkled the decaying wood chips that cover its roots with glitter. When the new “I DREAM” tree was all finished, David penned the first tag with a Sharpie: “I DREAM… of a day when ALL Americans are free to love and to be loved in return.” -David Fite, Eagle Scout Candidate, Troop 115. Want to add your own dream? Leave a comment below starting with “I DREAM…” and David will post it on the tree in your behalf. Fence photo by York Chan; David Fite’s photo by Jen Fite. When I learned that Nettelhorst’s Local School Council voted unanimously to let students opt out of the PARCC pilot exam–the first school in the country to do so–I was back in first grade like it was yesterday. Right before we were to sing Little Drummer Boy at the Christmas assembly, a filled auditorium paused as teachers led the entire Jewish student body (all three of us) off the risers to an empty classroom, where we sat at our desks in silence for the rest of the afternoon. I took from this humiliating experience that joiners get punch and cookies, and there’s little glory in rocking the boat. And so, it is with great trepidation that I humbly, and respectfully, ask that you allow my son to opt out. First, I’m a fan of raising the academic bar, but educators tell us the exam is developmentally inappropriate. When New York State piloted the PARCC exam, over seventy percent of students failed. Not to be all braggy, but I’ve got a PhD from UChicago, and found the 7th grade practice exam to be tedious and confusing. For kids like my 8th grader, who luckily nailed his CPS Selective Enrollment high school entrace exam, the slog won’t mean much. For a justifiably nervous 7th grader, on the other hand, rattled confidence will be more than a bummer. In my high stakes town, it’s likely a game changer. Frustrating children unnecessarily isn’t sporting; it’s counterproductive and mean. Second, while I’m also a fan of Illinois’ move to hop on the national Common Core Standards bandwagon, the PARCC test takes nearly ten hours to administer. As a point of reference, the GMAT and LSAT are three and a half hours long, the MCAT is five and a half, and the Illinois Bar tops the list at six. The beast will disrupt school for almost two weeks, and for schools that teach to the test (thankfully, not ours), it could hijack instruction for months. Chicago extended its school day on the grounds that every minute counts, so either it does or it doesn’t. How ’bout we err on the side that says time in school matters. Third, though it ruffles some feathers, so long as public school teachers have tenure, I’m going to be a big fan of accountability. This year’s test results aren’t tied to funding, and that’s a smart way to run a pilot. However, there seem to be more than a few bugs to work out. Forcing students with learning disabilities and compromised language skills to take a grade level test (even with additional time) will surely paint an inaccurate portrait of what’s actually going on inside our schools. Moreover, given that CPS students have such limited access to technology, mandating a computer-based test seems wildly unfair, particularily to schools in disadvantaged neighborhoods. While most Nettelhorst students are middle class, tech savvy and speak English at home, our school’s an exception. Paper and pencil exams may be more expensive, but so is faulty data. And fourth, I’m a still bigger fan of my neighborhood and the little neighborhood school that we’ve built. Yes, our test scores are excellent, but our school does as well as it does because a community joined hands and chose to invest their time, talents, and most importantly, their children. The PARCC test was created with some $360 million in federal funds. Imagine if all the resources we’re devoting to a defective and demoralizing exam went to building capacity and community engagement instead? I’m not entirely sure what happens with the handful of kids who aren’t testing, but I hope it’s not scarring. Truth told, so long as my son gets to play on his iphone, you could probably hold him indefinitely. But since we’re a Fine and Performing Arts school, I vote for a Joan Baez sing-a-long up in the gym. Or better yet, if every family chose to opt-out, teaching and learning could continue as usual, and then, everyone wins. Once we’ve turned in our signed request forms, your newsletter states that “the district requires a conversation between parents or guardians prior to opting out.” Yes, by all means, let’s have a discussion. But why stop there? There’s a national opt-out movement afoot. Perhaps if enough of us parents cry uncle, we could reign in this testing madness, and get on with the business of giving our kids the schools they deserve. The first time I watched the hit television show Shark Tank, Pat McCarthy was pitching his new product, a perfume called Money that purported to smell like freshly minted greenbacks. “The smell of money, baby! Can I get an Amen?” McCarthy calls, as scantily clad models throw cash in the air like confetti. “Amen!” the Sharks testify in unison. “Love the pitch!” one of the potential investors beamed, admiring the bottle packed in shredded U.S. currency. “Genius!” One Shark bit to the tune of a hundred grand. McCarthy’s offer weighed heavily on my mind as my startup, Youtopia, headed into the finals of the 1776 Challenge Cup. We were competing against 64 of the globe’s most promising ventures in education, energy, health and smart cities; if funded, any one of these startups had the potential to completely disrupt its field. If I were a betting woman, after voting for us (naturally), I’d have put my money on Reaction Housing to sweep the whole thing. Unlike Liquid Money, Reaction Housing’s EXO really is a genius idea. Back in 2005, while waiting in line at Starbucks, Michael McDaniel was staring at stacks of upside-down paper coffee cups, and fuming over America’s breathtakingly tragic answer to hurricane Katrina. Then Eureka! He raced home and designed EXO, a stackable, lightweight, temporary housing unit that would efficiently fill a cargo plane or shipping container, an invention that could revolutionize how we respond to natural and manmade disasters. As I watched EXO loose to, ostensibly, an even better idea, I fumed over the kind of bizarro universe that bestows seed funding on l’eau de dough over humanitarian relief. If Michael pitched his idea on Shark Tank, would he send out adolescent flood victims in daisy-dukes and bikini tops carrying miniature FEMA trailers or Superdome snow globes? In a country that increasingly evaluates entrepreneurs in game show format (along with singers, chefs, designers, dieters, lovers, fill-in-the-blank), how can socially responsible startups ever capture the public’s attention? Perhaps the brilliance of the Challenge Cup is that it combines the theatrical aspects of Shark Tank with the passion of entrepreneurs addressing seemingly intransigent societal and environmental problems. However, business savvy do-gooders are not created in a vacuum. If we want more viable mission-focused/for-profit startups in the pipeline, we need more accelerator programs like Chicago’s Impact Engine. Lots more. Moreover, companies that want to disrupt incumbents need support, because doing good means going against traditional thinking. Abby Ross, co-founder and COO ofThinkCERCA, and a graduate of the first Impact Engine cohort, argues that the accepted high-growth technology mantra to ‘build one thing and scale quickly’ is tricky when it comes to education. 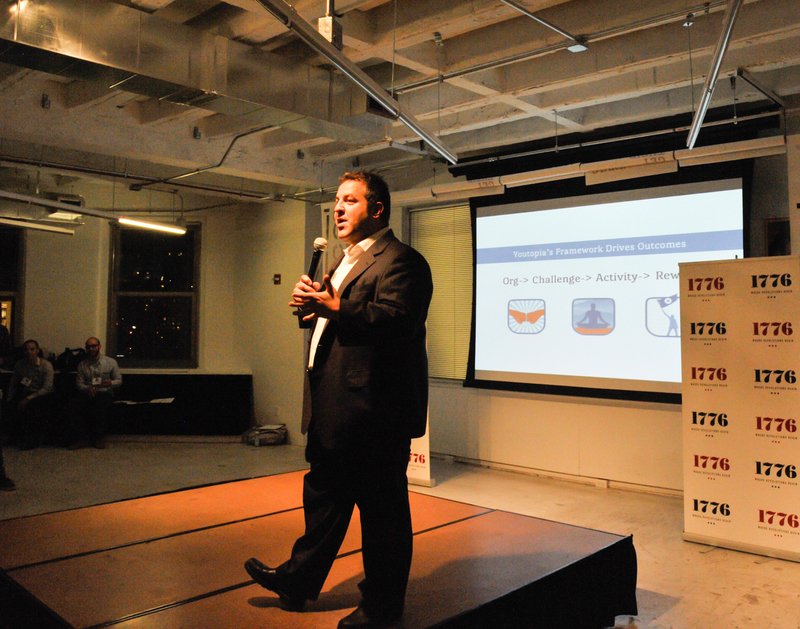 Youtopia’s founder and CEO Simeon Schnapper pitching at the 1776 Challenge Cup in Chicago. My darling Maya upheld her end of the bargain: straight A’s, perfect attendance, gushing teacher recommendations, and more than respectable ISAT scores. She’s loved her brother to pieces and has managed to walk the dog through Chicago’s blistering winters without too much prodding. She’s a good kid. My friends are raising similarly amazing little munchkins, and yet, here we all are, waiting on pins and needles for the CPS computer to spit out a letter informing us if our kids made it into one of Chicago’s selective enrollment high schools — about as likely as the Cubs winning the World Series. Of the 10 selective enrollment high schools, five consistently rank in the top public schools in thecountry, and admission is fiercely competitive. This year, Payton accepted only 2.2 percent of the 10,969 students who applied. Both Young and Northside accepted less than 3.5 percent. With those odds, it’s easier to get your high school senior into Harvard. For decades, middle-class parents have been demanding more quality options, and CPS responded with several new selective International Baccalaureate and Fine and Performing Arts programs, with a separate (and even more complicated) admissions rubric. However, after US News and World Reportranked Lincoln Park as one of the nation’s best schools (thanks to its IB cohort), getting into one of the city’s long-established IB programs became nearly imposible. Receiving an acceptance letter from a well-regarded Fine and Performing Arts program is such a rarity, one imagines the whole neighborhood would erupt into a spontaneous FAME flash mob. My little Maya has applied to all three types of schools — fingers crossed the kid aces the computer match, interviews like Katie Couric, and sails through her dance audition like Jennifer Beals. Navigating the admission system used to be like reading entrails or the vast migration of birds, but CPS has worked hard to streamline the process. This year, CPS unveiled an in-depth online high school guide that even lists cut-off scores, and a nifty user-friendly point-calculation tool. Next year, parents can expect a single application for all high schools, a virtual one-stop-shop for selective enrollment, IB, magnet, STEM and CTE options. And yet, despite these many improvements, lots of middle-class parents are pining for the good ol’ days. In my city of Big Shoulders, where pay-to-play is an art form, well-connected or über-eager parents used to circumvent the official admissions process by currying favor with principals in a process that was universally called “making your presence known.” But in 2011, CPS limited “principal discretion” to 5 percent and instituted a complex quota system defined by socio-economics factors instead of race. In a midwest version of Stratego, officials carved up Chicago into four distinct enrollment tiers based on median family rates of income, education level, home ownership, single-parent, English-speaking, and neighborhood school performance. While a student’s ‘free-and-reduced’ lunch status would provide a more individualized measurement, 86 percent of all CPS students already fit that designation, plus the program is notoriously rife with fraud. In a city as historically segregated as mine, the new tier-based groupings are likely more accurate than not. Not surprisingly, parents — particularly private school parents — were rumored to be falsifying their residency on SEHS applications. So much so, that CPS responded with a special hotline to turn in scofflaws to the Inspector General — as if narking might somehow free up one more coveted spot. Given the stiff competition, scarcity of spots, and above-board application process, savvy parents try to give their kids every possible edge. Tier Four parents make their kids take SelectivePrep test-taking classes, solicit teacher recommendations, and craft inspiring personal essays (even though schools aren’t supposed to accept them). Although the “official” Principal’s Discretion Application process will open next month, skittish parents lobbying began months ago. CPS argues that all the hype and hysteria skews the data. Of the students who scored at 800 or above on the SEHS exam, 89 percent received an offer; and of that pool, 41 percent got their first choice. However, the reality is that not every kid is qualified to go to the top schools, and parents need to widen their consideration set. This year, CPS opened five new Early College STEM Schools, a selective enrollment program at South Shore, and six wall-to-wall IB high schools will open next year. Harvard isn’t the only game in town. My crowd insists that this isn’t elitist Snow Plow/Tigger Mom parenting at work: beyond the choice schools lies a steep academic cliff. This year, 18,000 eighth graders applied for 4,340 spots. When the dust settles, 13,660 kids will be kicked back into the regular CPS system, where less than 9 percent of all high students meet college readiness benchmarks on the ACT. Nine. Worse still, there’s the unspeakable reality that many of these schools are downright dangerous. No school supply list should include a Kevlar vest. Over the next few days, parents across my stormy, husky, brawling city are opening letters that will shape their future in profound ways. Some, who had the foresight to hedge their bets, will take out second mortgages to pay the hefty tuition at private or parochial schools; others will try their luck at one of the unproven new STEM or wall-to-wall IB programs; a small but intrepid handful will choose to home school; but most will pack-up the family minivan with all their kid-gear, creative energy, and potential tax revenue, and hightail it to the suburbs — and p.s. It won’t be because they felt the siren’s call of an Olive Garden. Can Kangaroo Dads Beat Tiger Moms? Like many parents who read Amy Chua’s Battle Hymn of the Tiger Mother, I flogged myself for raising two perfectly perfect child generalists. I’ve simply lacked the discipline or will to raise a dancer like Baryshnikov, a cellist like Yo Yo Ma, a tennis player like Venus Williams, or an engineer like… Um. Um. The fact that I can’t name a single rock star engineer didn’t seem like a big deal until the second debate when President Obama argued that our country’s economic salvation hinges on our kids becoming world-class engineers. We all know that our students need to do better at math and science to be competitive in the new world economy, and sure, we also want them to be crackerjack American innovators, but what are we really doing to motivate them? If the Tiger Mom offers one approach to inspiring greatness, Chicago’s dynamic ‘maker’ community offers an alternative: meet the Kangaroo Dad. By day, you can find these super dads holed-up in local incubators, meet-ups, or the two-day, invitation-only, groovy gathering of the Midwest’s tech community called ORD Camp. In cyberspace and real space, these Kangaroo Dads are buzzing over how they can help build motivation through invention, entrepreneurialism and practical application. Joe encouraged Lily to answer a real-world problem. Lily’s grandfather has Parkinson’s disease and often knocks over his coffee at breakfast. Lily played with a moldable plastic from Inventables Joe had leftover from ORD Camp until she landed on a unique stackable, three-legged design that’s virtually spill-proof. 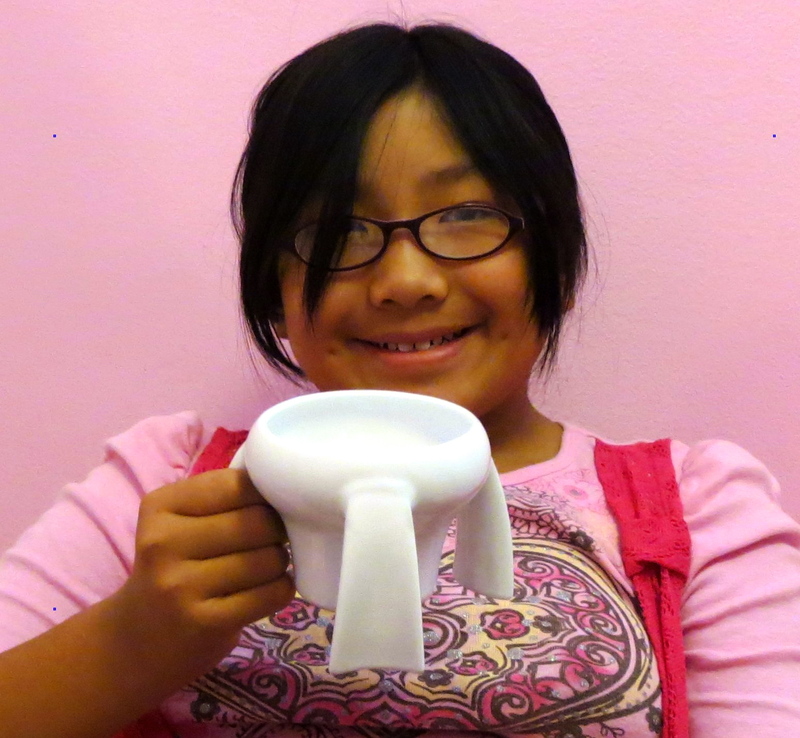 With the help of her dad, Lily has spent almost a year bringing her “Kangaroo Cup” to market, even traveling all the way to her native country of China to have samples made. “The Monday after launch, she went to school with a new found confidence that was obvious to everyone” said her dad, and with $10,000 in crowd-sourced pre-orders on Kickstarter and Indiegogo, her design is already looking like a success. Fingers crossed that Lily is lucky enough to graduate with an engineering degree debt-free. “Lily’s amazing story perfectly captures the spirit of what we want every kid to believe and achieve,” says Kangaroo Dad Ted Ganchiff. Like Joe, Ted hoped to buttress his 10-year-old son’s Alex’s public school science program at Nettelhorst, the little elementary school my two kids also attend. After supervising the school’s science lab renovation with funds from U.S. Cellular’s Calling All Communities Challenge, Ted hit the pavement and forged partnerships with Chicago area entrepreneurs and universities for a pilot program, codenamed SEE (STEM and Entrepreneurism Exchange). If the Tiger Mom insists that parental drive motivates children to greatness, the Kangaroo Dad focuses less on blind discipline, and more on identifying his child’s unique skills and spring-boarding from there, bouncing happily to wherever the spirit of innovation leads. And still more, every kid can succeed along the way. As we navigate this new interconnected and inter-dependent age — a time which values invention, collaboration and dedication more than soul-crushing technical skill — perhaps it’s time to rethink the uber-parent. Yup, Kangaroo Dads. They’re the future. Hippity-hop. Daughter: But Daddy, I wanna stay up and watch TV. Dad: Sorry, sweetheart, it’s a school night. Dad: Ooooooooh right—Let’s watch Conan! This was not just any Second City show. Joining main-stage actors for a spirted game of freeze tag were the company’s administrative assistants, instructors, bartenders, and scores of CPS students improvising their little hearts out. With all the hullabaloo, it’s easy to overlook one of the most striking features of last week’s strike: In my stormy, husky, brawling City of Big Shoulders, community members, faith leaders, parents, and neighbors came together to support our kids, the only ones truly shafted by this grown-up mess. From park districts to libraries to not-for-profits to private homes — almost every kid in this increasingly dangerous city had a safe place to ride out the strike. And because the near-bankrupt Chicago Transit Authority offered free rides to every CPS student, some 400,000 kids could even get there. Thanks to the generosity of my fine city, my two kids hopped the #151 bus to Old Town (by themselves!) where they played improv games and studied sketch comedy at the Second City all day long. For free. Yes, and… Saying ‘no’ is verboten; obstructionists are scum. A yes-man may boost your confidence, but he doesn’t add much. You must move the scene forward. Teamwork. As any Chicagoans who has helped a neighbor shovel-out his car after a blizzard can attest: We are all in it together. No grandstanding. Honesty. Be true to your character. Own it. Midwestern integrity is a value. Confidence. Don’t waste time second-guessing. Sometimes your choices won’t be popular — the hard ones seldom are. Empathy. To feel for your teammates, you must truly listen — and that’s hard (harder still if you don’t make eye contact). No Judgment. No bulling, no mocking, no exclusion, no cliques. Be respectful. Laughter. Humorless people are exhausting. Have fun. Be Generous. Laugh hard. In what has been a gut-wrenching experience for everyone, for all of it, I love, love, love my city. Fingers crossed this strikes ends soon. From the great Mark Twain: “Chicago — a city where they are always rubbing a lamp, and fetching up the genii, and contriving and achieving new impossibilities.” Monday is a new day. No need to wait for next year’s inevitable strike over teacher pensions; The Second City offers exceptional programming for children year-round, including extended day camps during school breaks.